This Circle in A Square Border completes the Squaring The Circle CAL 2018! Thank you to everyone who participated in this crochet along. I loved getting to see all the gorgeous squares and am looking forward to seeing the completed blankets. 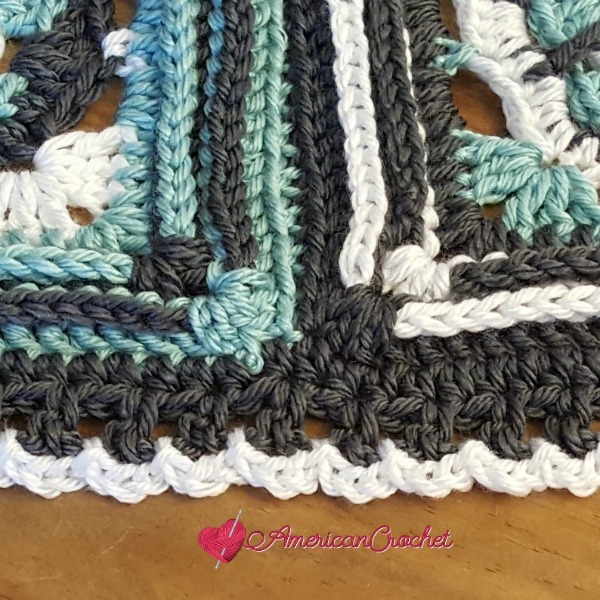 Because the blanket is so textured with so many different stitch designs, we decided that it would be fitting for you to choose your own border! I have selected from popular, quick and easy to also a bit more advanced edgings to choose from. Have Fun! I have not joined all of my squares yet or added the border to its entirety. I am sure you all are wondering why. For now all I can say is be watching for future publication. In the mean time I have put together a few different edgings that I think will give the blanket that finished touch. Round 1: Work 3 hdc in same stitch as join, * hdc in each stitch and space (where squares are joined) across, work 3 hdc in middle of 3 corner dc, * repeat from * to * around; join with a slip stitch in the 1st hdc. Round 2: Chain 1 (See Notes), sc in same stitch, * chain 3, skip next stitch, sc in next stitch, * repeat from * to * around; join with a slip stitch in first sc. Round 3: * Chain 3, slip stitch into next chain 3 space, * repeat from * to * around; join with a slip stitch in the base of the 1st chain 3 space. Don’t care for this border? No worries! Check out these links for an assortment of borders you can choose from!